Stop taking your dog for a walk and instead let your dog walk you. It could lead you to some interesting places and you might learn something new about your dog. Letting your dog walk you turns the daily route into something fresh and exciting. Running increases stamina and strengthens muscles – for you and your pet. Going for a run also provides a great opportunity to leash train your dog and get the two of you in sync. Remember to listen to your dog’s body as well as your own. If they need to stop, stop! Want to connect with other dog owners? Start playing flyball! Flyball is basically a dog obstacle course. Teams of dogs race against each other, jumping over hurdles, to a box that releases a tennis ball that the dog catches and returns to their owner. Refine your dog’s obedience and agility while making some friends along the way. Whether you’re looking for some competition or just a little fun, ask your local kennel club about agility groups, classes, or competitions in your area. As everyone knows, dogs have a keen sense of smell that makes them great hunters and trackers. If your dog proves good at this, you can even enter them into a tracking competition where a scent trail is laid out beforehand and dogs must find and follow it. Fetch is a classic for a reason. If you’re looking for something that’s low effort on your end, this is a great activity. Whether you play it in an open field or just throw items from the comfort of your couch, a good game of fetch should never be underestimated. If your dog plays well with others, then take advantage of it! Pay attention to other dog owners in your neighborhood while out for walks or form a puppy playdate group with your friends and family. Your dogs can exercise while you socialize. Exercise your dog’s brain while you exercise their body. Beyond basic puppy training, dogs often aren’t taught much more. Try stretching your dog’s capabilities by teaching them a fun skill or trick such as high-fiving or bowing on command. For all of the yogis out there, why not include your dog? Find a good organized doga class in your area that welcomes participants from any skill level. Let both you and your pet achieve better flexibility and relaxation together. 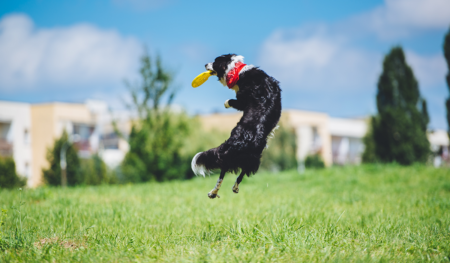 When it comes down to it, exercising your dog is really about having fun and spending quality time together. Don’t get bogged down by one activity. Take time out of your day to just play around and interact with your dog. They appreciate it more than you know!